Earn up to 65 NEXUSPoints. 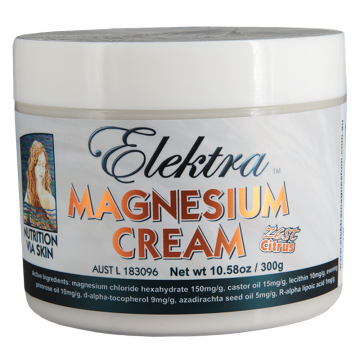 One dessertspoon of Elektra Zest Citrus Magnesium Cream 20g to cover the whole body provides approx. 250-300mg of elemental magnesium, equivalent to the average daily recommended magnesium requirement. Some individuals may need two or three times this much magnesium in cases of more severe magnesium deficiency. In this case extra magnesium can be supplied via Elektra Magnesium Oil Spritz, as well as foot soaking or bathing with Elektra Magnesium Flakes. SUPPORTING: Purified water, Butyrospermum parkii (shea) butter, Cetearyl alcohol, Prunus amygdalus dulcis (sweet almond) oil, Macadamia integrifolia seed oil, Prunus armeniaca (apricot) Kernel oil, Cocos nucifera (coconut) oil, Ceteareth-20, Theobroma cacao (cocoa) seed butter, Azadirachta indica (neem) oil, Naticide (natural preservative), Xanthan gum, Potassium sorbate, Lactic acid, Essential oils of: Cymbopogon citratus (lemongrass), Citrus bergamia (bergamot bergaptane-free), Vanilla planifolia. Elektra Magnesium Oil Spritz 180mL formula glides on and absorbs easily, with the fresh fragrance of mandarins. It can be used in massage to relax tight muscles and joints when you need something ‘heavy duty’!